Day dreaming about the past, and doing it while wearing a pair of rose colored glasses. The past was not all the great, but we filter out the parts we didn't like and just recall the fun. 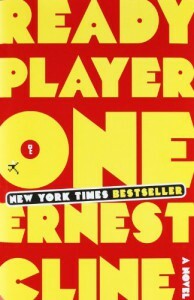 And that what it was like reading [b:Ready Player One|9969571|Ready Player One|Ernest Cline|http://d.gr-assets.com/books/1333576871s/9969571.jpg|14863741] fun. If you there the little inside jokes are fun and if you were not the whole decade is presented as fun. That is what the book is just fun. It is not great. It is not deep. It is easy to guess the ending and you can see that the idea of making it into a movie was the goal from the start. That okay because sometime we just need Fun.